Even as worries about emerging markets and President Donald's trade war continue to dog the stock market, a closely watched contrarian indicator hit its lowest point in months, underscoring the market's resilience at a time when global risk looms large. "In August, the Sell Side Indicator - our gauge of Wall Street's bullishness on stocks - dipped slightly for the second month in a row to 56.4 from 56.9," said Savita Subramanian, equity and quant strategist at Bank of America Merrill Lynch, in a Tuesday note. "The indicator is currently at a nine-month low, a reversal from the rapid rise in sentiment from the middle of 2016 through the end of last year." 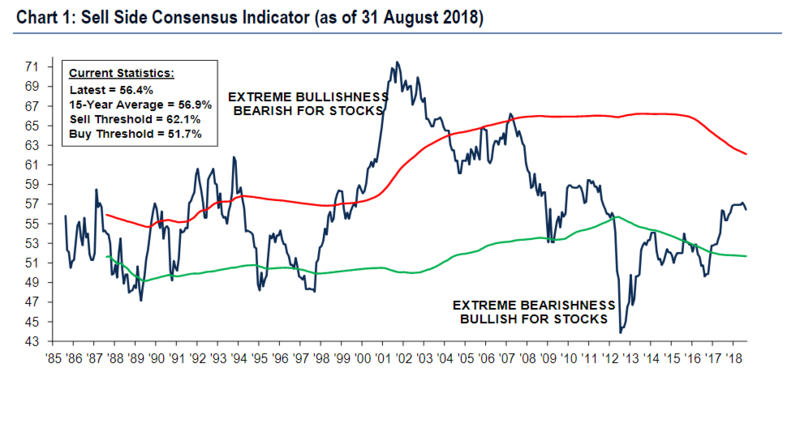 The indicator, based on recommended equity allocation of Wall Street strategists, serves as a contrarian barometer in that when the index is bullish, it is usually the opposite for the market, and vice versa. As it stands now, Subramanian projects a 12-month price return of more than 10% and a 12-month target of 3,202. "Historically, when our indicator has been this low or lower, total returns over the subsequent 12 months have been positive 94% of the time, with median 12-month returns of plus 19%," she said. Jonathan Golub, chief U.S. equity strategist at Credit Suisse, also projected more upside for stocks, forecasting the S&P 500 to hit 3,350 in the next 16 months. "The next 16 months will be particularly tricky for investors, with the threat of yield-curve inversion, potentially disruptive midterm elections, and continued Fed tightening," he wrote in a report. "Despite these headline risks, we believe that solid economic/EPS growth and benign recessionary risks will be sufficient to propel the market higher." The stock market has been surprisingly placid even as Argentina and Turkey reel from currency meltdowns and South Africa sinks into a recession. In the meantime, most major economies have been preoccupied with Trump's agenda to revamp and revise existing policies and agreements as he embarks on a campaign that he believes will level the playing field for the U.S. on the trade front. Strategists led by Ethan Harris, global economist at BAML, believe that some of the market's composure is due partly to the fact that all the trade deals tackled by Trump required very "modest" concessions, with symbolism playing a big role. They also view the Trump administration's trade battles as a "cold war" that could continue indefinitely with intermittent flash points. Investors should brace for volatility, they said, pointing out that attempting to contain the U.S.'s trade deficit can cause disruptions in other areas. Even so, the S&P 500, the Dow Jones Industrial Average and the Nasdaq all gained in August, a month that is often plagued by summer doldrums. And analysts are even cautiously optimistic about the market in September, reputed to be among the weakest months of the year. 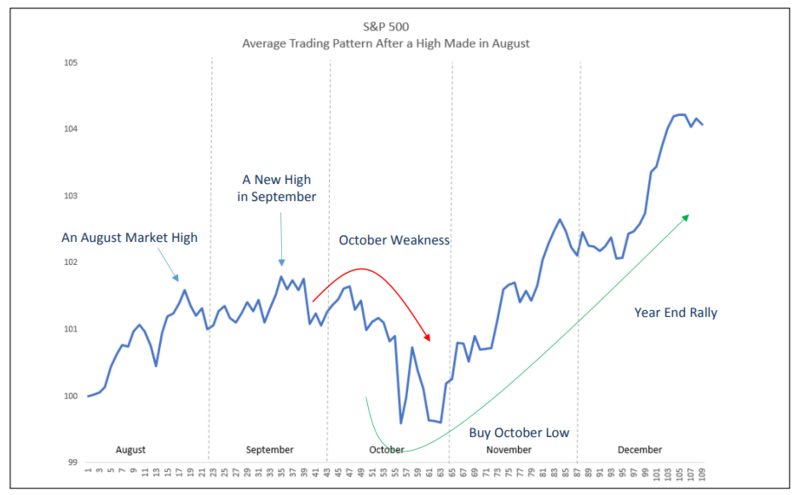 "Since 1980, there have been 14 years when the S&P 500 made a high in August, just like the current market. Averaging those years together, we found the bullish price momentum continued into September," said JC O'Hara, chief market technician at MKM Partners, in a report. The market could also get a boost from hedge funds who are looking to get back into the hunt for returns after a rough couple of months. "The average long short equity hedge fund is back in positive territory for the year after a difficult period from late July into August. Their returns started to pick up mid-August and we believe a performance chase will likely be on for the first half of September," said O'Hara.